Healthy cooking & fun kids meals! Gluten Free Chocolate Chia PROTEIN Bites – Quick & Easy! Mix all ingredients together in a bowl EXCEPT the coconut. I find it best to knead it like a dough with my hands as it will start out pretty crumbly. Slowly add the milk in as the amount needed will probably differ with different protein powders. Once you have formed one large dough ball, break off pieces and roll into desired size balls and place on a piece of wax/parchment paper. 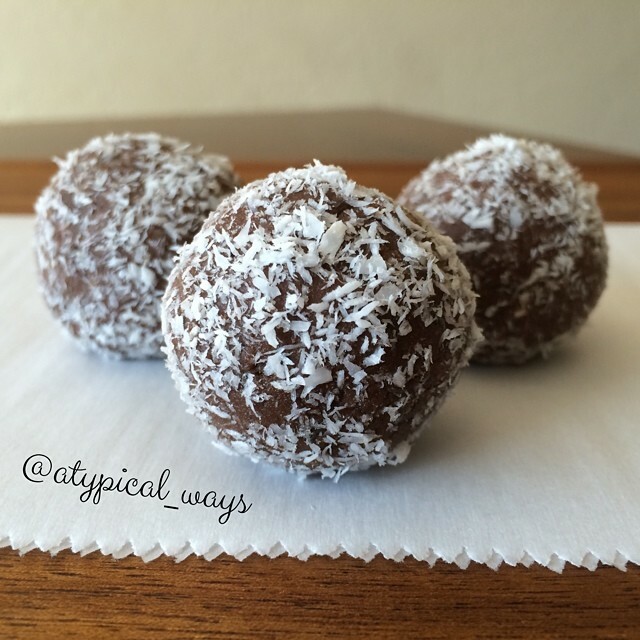 After you have all of your balls formed, place the coconut on a plate and roll each ball. Store in an airtight container in the refrigerator. Make sure to head on over to my Instagram page for a chance to win these! Make sure to head on over to my Instagram page for a chance to win these – @atypical_ways! TOMORROW IS THE DAY TO SUBMIT YOUR ENTRIES, GET READY! You don’t want to miss out on these great prizes! Do you have what it takes to be our next #FingerFoodConnoisseur? Theme: COCONUT – used in any creative way you see fit as a ‘finger food’. Submissions begin on Friday, July 25th and end the same night at 11:59GMT – the entry must be a NEW post. You must be following @atypical_ways & @sweetspreads. Make sure to tag both of us in your entry submission. 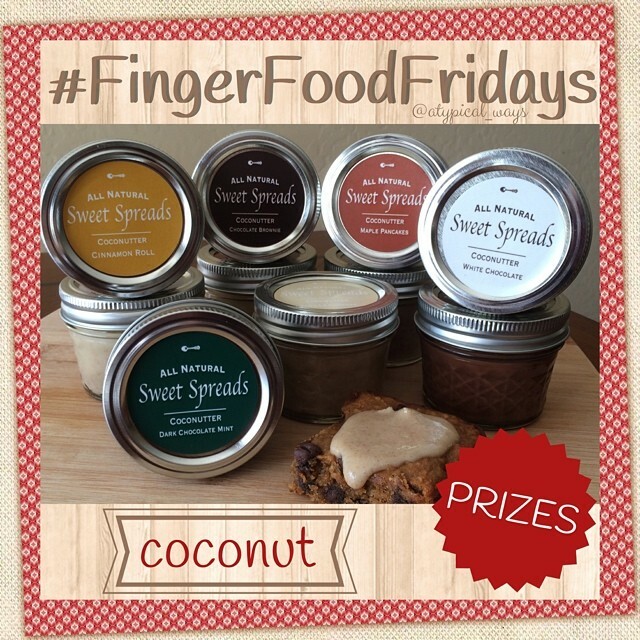 Also, be sure to use the hashtag #FingerFoodFridays in the ORIGINAL PICTURE CAPTION (not comments). Winner will be announced on Monday, July 28st with the following weeks theme! Good luck & I can’t wait to see what you come up with! Vanilla protein pancake rollups stuffed with caramel & cinnamon toast crunch cereal & topped off with a HUGE scoop of vanilla ice cream DEEP FRIED in cinnamon toast crunch! WARNING – this is not my typical healthy post! It’s my weekly pancake competition entry! 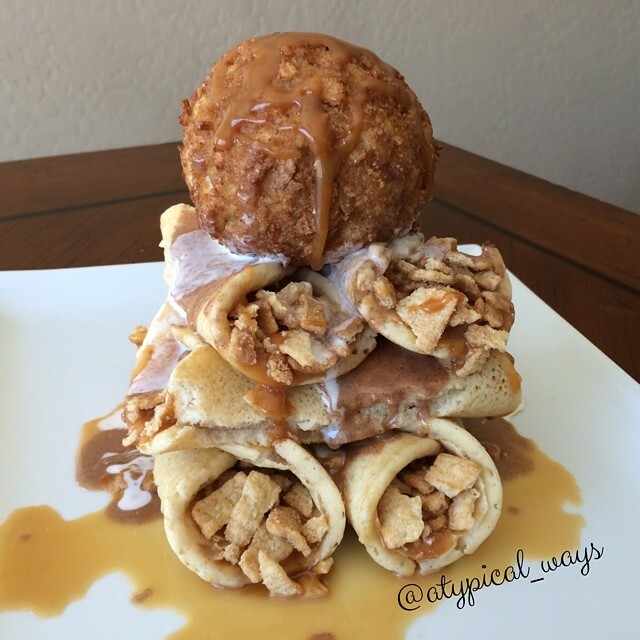 Vanilla protein pancake rollups stuffed with caramel & cinnamon toast crunch cereal, smothered in Sweet Spreads cinnamon roll coconutter and then topped off with a HUGE scoop of vanilla ice cream DEEP FRIED in cinnamon toast crunch – BOOM! I am the queen of online shopping! Allow me to introduce you to my most recent find – Sweet Spreads Coconutter which is an all natural flavored coconut butter. I had seen many different people posting about these all over Instagram. So of course, I had to try it! OH MY GOODNESS, I had no idea what my taste buds were in for – WOW! 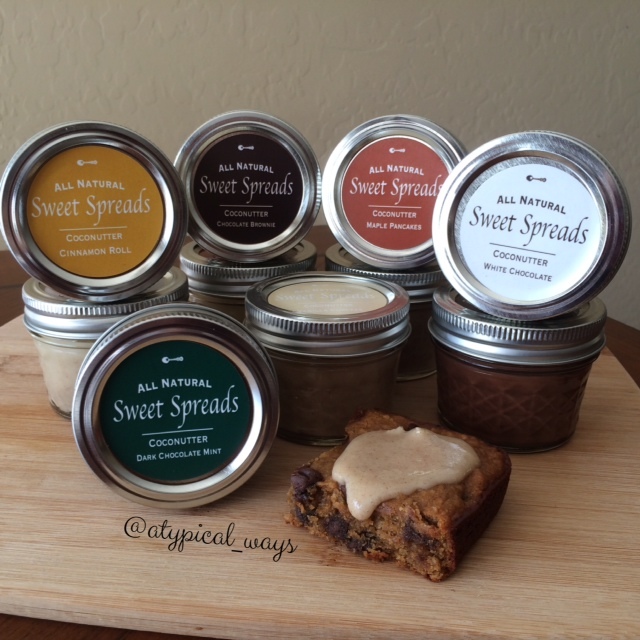 I picked up the sampler pack which came with 6 smaller jars of their White Chocolate, Cinnamon Roll, Maple Pancake, Chocolate Brownie, Dark Chocolate Mint & Vanilla Cupcake (which is what you see on top of my blondie in this picture!). It was seriously hard for me to pick a favorite but I think I’m leaning towards the Dark Chocolate Mint! It reminded me of either a thin mint cookie or Andes mint.